A few folks asked me recently how do we keep our huskies cool and comfy during summer, so I thought I´d share a few pics and tips of what we do. Luckily, living in Northern Sweden comes with short and not too hot summers, which is ideal for our double coated Siberian huskies. However, nearly every summer we experience a heat wave of some sort and even the not so extreme temperatures can make the dogs uncomfortable. I believe that a big part of the dogs´ well-being, summer or winter, lays in the way their living is organized. If your dogs live outdoors all year round or most of the time like ours, so many aspects and details have to be considered. A nice, airy kennel or lot situated on a good spot, where breeze is allowed, but where the dogs are also protected from too much drift is a start. We have built our kennels on places where trees act as shadow casters and one of our two kennel buildings has a roof. We keep all or geriatric dogs in these kennels, along with all the dogs who seem to cope a bit worse with the hot sun. Creating at least partial roof is a wonderful idea and mostly our geriatric dogs appreciate the shade it provides. Another thing you can do to create some more shade in your kennel is to hang some bamboo "curtains" over the kennel fencing. We take these out every time the weather turns hot and these shades offer an immediate long shade, cooling down the kennel by several degrees, while still allowing breeze and air to circulate. Also, the natural material, light color and mostly air and space between the bamboo sticks don´t absorb much heat. One big bonus is that these bamboo shades are pretty inexpensive too and last pretty long. We´ve had ours for about eight years now and they are still fine. A very effective procedure (forgive me, I was not able to find the pictures I wanted to share) is spraying the wooden kennel floors and platforms in front of the dog houses with a water hose. That cools the surface instantly and the dogs appreciate the possibility to lay down and cool off on the wet wooden floors. When exercising your dogs in summer, consider doing so early in the morning or later in the evening, if possible. While our dogs live in a pack and we do not exercise them over summer the same way as folks with one or two pet dogs, we still let them out in the big play yard. Actually, we opt for letting the fur kids out to run and play in their own pace, when the weather is very warm. 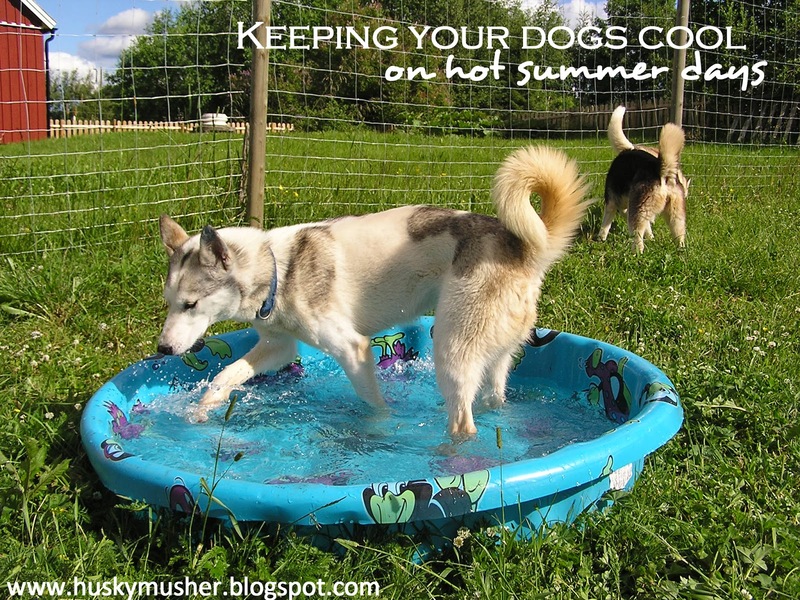 But even if you do so, make sure the dogs have enough cool water sources around. With huskies, even if they run and play in their own pace, they can overheat incredibly fast and results of that can be extremely serious and life threatening. 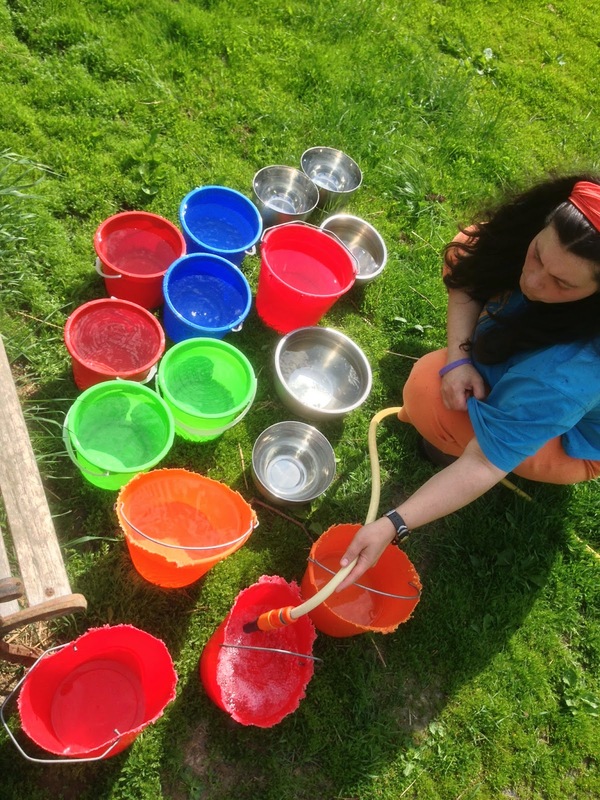 We have several water tubs placed around the dog yard and dog lots and we change the water in them as often as needed. The kids don´t just drink from the tubs, but many love to play, sit, lay and go crazy in them! Big and small alike, they all enjoy their little swimming pool tremendously! When we do decide to take one or more of the kids for a walk on a warmer day, we always opt for an area with easy access to water, where we intentionally bring them to cool off. Most of our dogs just love the lakes, ponds and creeks. 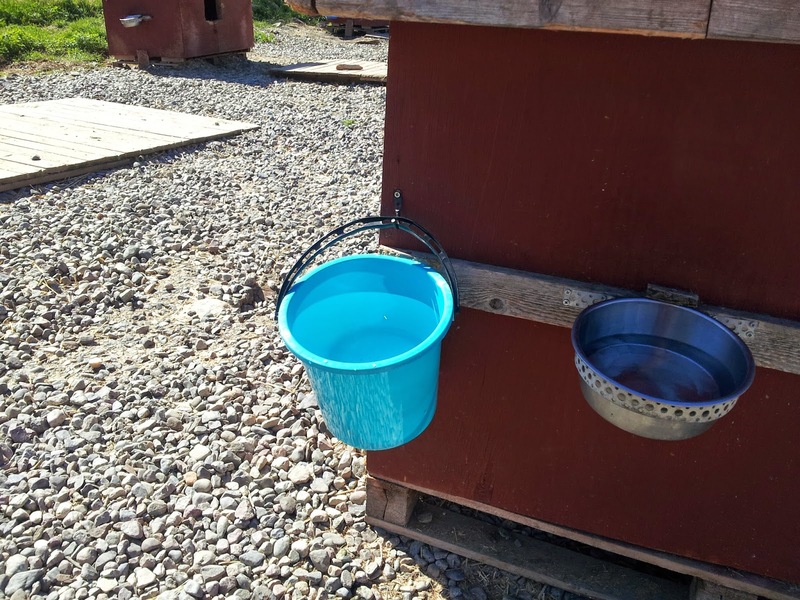 Despite having plenty water in the various tubs throughout the dog yard, we make sure that each dog or each pen has good amount of clean fresh water every day. One of the first rules in our kennel that all our dog handlers and kennel help learn is that water buckets must be full and clean at all times. Refilling water every morning and then again after evening feeding is a must. It also gives us a opportunity to check if someone may have accidentally (or on purpose :)) flipped their water dish or bucket, and to spend few extra minutes with each dog. During heat waves we even fill the dogs´ food dishes with water for the day as well, so everyone has their double water "stock". 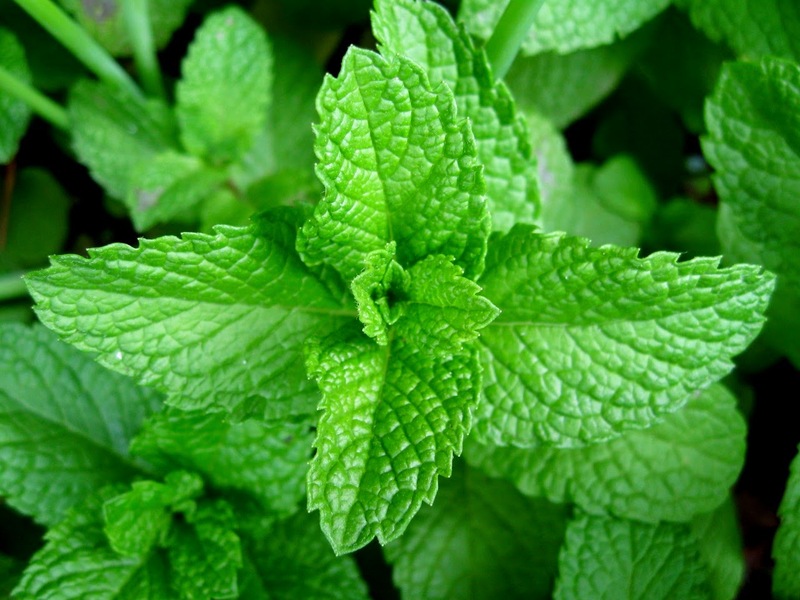 Adding fresh, finely chopped mint leaves into your dogs´ food or water will cool them down. You can also make mint ice cubes, by filling an ice cube tray with the chopped leaves and water. Toss few of the ice cubes into your dogs´ water bucket or dish to keep the water colder for a while and to add that refreshing cooling effect of this wonderful, healthy herb. 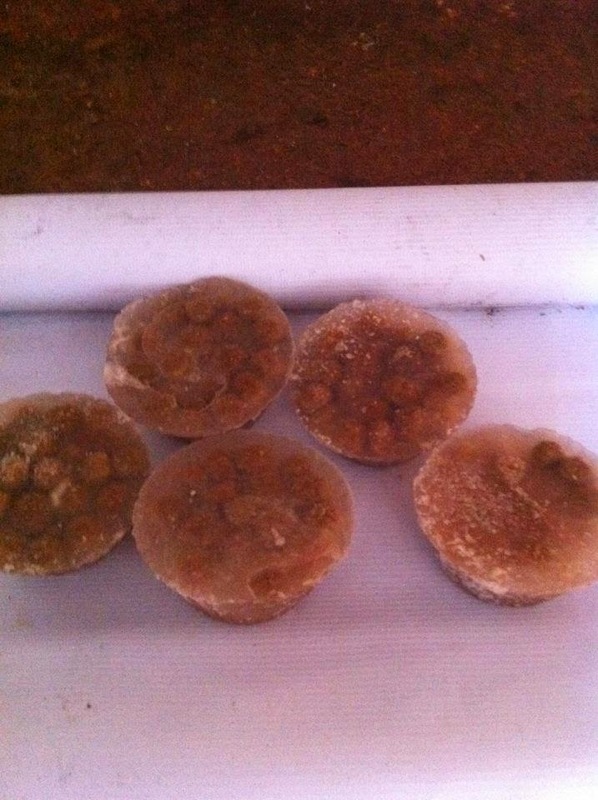 While I personally do not like to feed my dogs, nor recommend to feed with frozen meat all the time (snacking our sled dogs with frozen fish and meat snacks during or after training runs and at races is already more than enough), because it is simply not healthy for them, you can make an occasional exception on those extra hot days and create frozen "cup cakes" and other types of fun food for your dogs. You can use kibble or chunks of meat, canned food or whatever you feed with and desire to try. Mix food with water in a plastic or metal bowl and put in freezer. When it is solid frozen, turn it bottom up, pour some hot water over the outside walls and bottom of the dish and let the frozen "pie" pop out of the dish. And here is an all time favorite, which is very popular on the internet every summer. 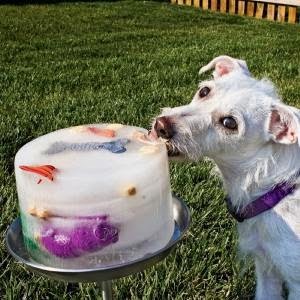 I hope that some of these tips will help you and your dogs beat the heat and wish you a pleasant summer with a perfect weather! Excellent - thanks! I do find the watering the kennel with a hose helps a lot, especially with the rocks borders. Yes, it seems to be one of the most effective cooling methods with longer lasting effect at our kennel too.